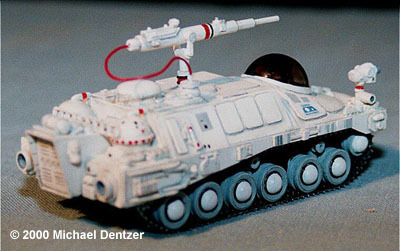 Michael Dentzer's Alpha Moonbase Laser Tank - third version. 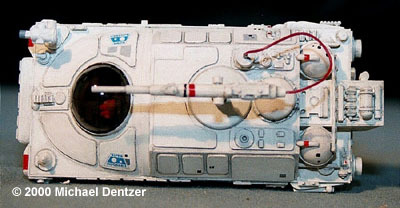 This is the third version of the laser tanks seen in the Space:1999 episode “The Infernal Machine”. 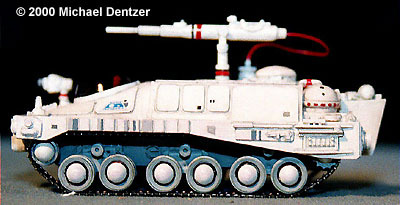 I built it to 1:100 scale to accompany my SMT Primary Defense Tank and scratchbuilt Tank #2, as well as the AMT/ERTL Eagle and MPC Hawk. 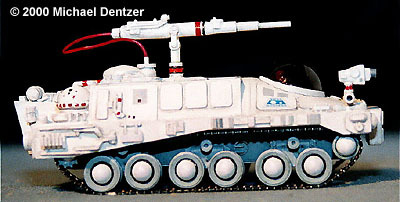 Built, as with the other tanks, on the 1/72 scale Airfix Chieftain tank chassis, the body is constucted of sheet styrene and lavishly garnished with greeblies. 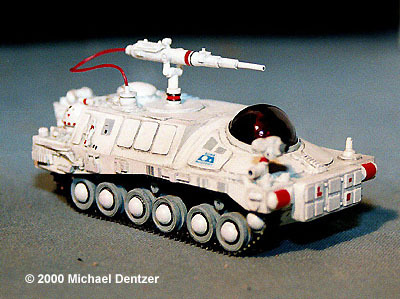 The laser gun is built from bits from the parts box and styrene rod. It's painted with Testors Model Master flat white for the body, MM grays for the chassis and panel accents, and weathered with a wash mixture of Humbrol #33 flat black diluted in water. For the black and orange striping I used permanent fine-tipped markers. The canopy is a bubble cut from transparent blister wrap from a discount kid’s toy that I tinted with a mixture of Future Floor Wax and fountain pen ink.